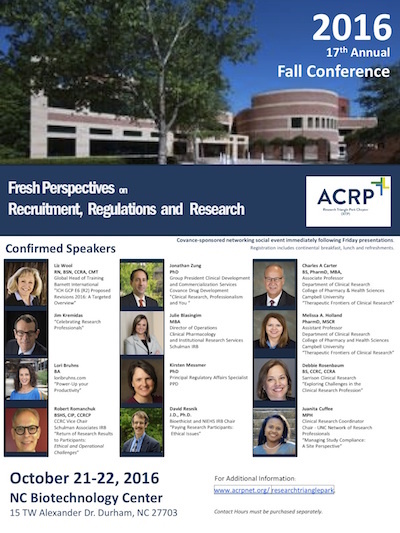 The Fresh Perspectives in Recruitment, Regulations, and Research is a two day conference that will include best practices on engaging participants in clinical trials, ethical/compliance considerations associated with regulatory changes, as well as provide insight into topics at the forefront of today’s clinical research. The expert presenters will enable clinical research professionals to become knowledgeable about current regulations and the evolving research landscape. Attendees will have the ability to obtain 12+ Continuing Education Units. 4. Gain knowledge of how to be successful in managing clinical research trials.